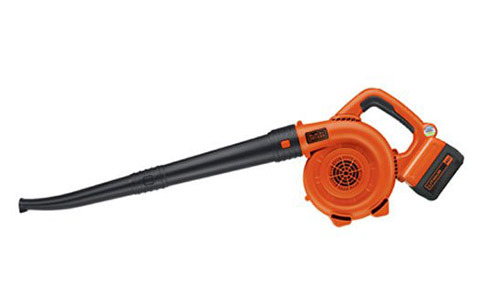 A leaf blower is a great addition to your lawn care tools. They’re great for fall weather, but they perform many other functions as well. Some double as snow blowers, others are the perfect size for cleaning clogged lawn mowers, or riding mowers. You can even use them to blow the dust off your driveway, sidewalk, or workshop. While gas-powered leaf blowers tend to be stronger, there are many reasons to choose a cordless electric. In the first place, they tend to run quieter, and be a lot lighter than your gas powered leaf blowers. They also require a lot less maintenance. Most have rechargeable batteries, and even when the battery needs to be replaced, it’s a lot cheaper than buying the gas and oil needed to keep a gas-powered leaf blower functioning in top form. But which leaf blower should you choose? This depends on the kind of work you need to do, and your personal preferences. 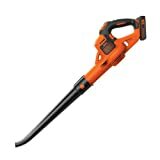 To make the decision easier for you, we have compiled this list of the top ten cordless leaf blowers. Buy now from Amazon → The Greenworks 40V blower is a great leaf blower. It uses a GMAX 40-volt lithium ion battery, which takes 1 hour to charge a 2.0 amp battery, and 2 hours for a 4.0 amp battery. There’s a lot of versatility in this little blower, including a variable speed motor which can reach speeds of 150 MPH. It’s very light, and ergonomic. The battery, running at top speeds, can go for more than 30 minutes at a time, and the extension tube makes precision and difficult-to-reach jobs easy. By adding an attachment, you can turn your blower into a yard vacuum. The Greenworks blower is a great little machine, and powerful for its size. But it doesn’t give you a lot of power when dealing with wet yard debris, and the yard vacuum is much less powerful than the blower. Buy now from Amazon → The Toro Power Sweeper is a great price for a powerful little machine. It’s a corded electric leaf blower, which can hit maximum speeds of 160 mph. It’s lightweight, only 4.6 lbs. At just around $50, this two-speed, 7 amp motor is powerful enough for light yard work, and the 130 mph speed is great for cleaning the car or sweeping the sidewalk. The one downside is that this is a corded model, giving you less freedom of movement than a cordless electric. The cord is also not included in the box. 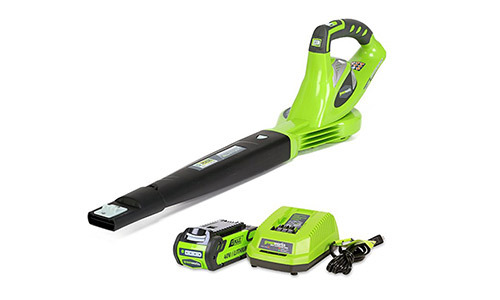 However, you’ll never have to wait to recharge, or purchase new batteries to use this blower. The two-year warranty also helps you save even more in the long run. Buy now from Amazon → Don’t let the voltage foll you. Though the DeWalt has a 90MPH max and a 20V motor, the wide nozzle means the CFM speed goes as high as 400. It includes a 5.0Ah Lithium Ion battery and charger. The included limited warranty is 3 years. Because it is a brushless motor, it’s a lot more powerful than similar electric models, even those with more powerful motors. Because it is a cordless model, the Dewalt is very portable, and the 5.0 Ah Lithium Ion battery runs for up to 2.5 hours at full speed. 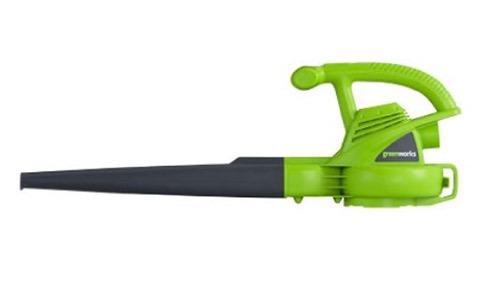 Buy now from Amazon → The Greenworks 24012 7 Amp is a powerful corded electric leaf blower. 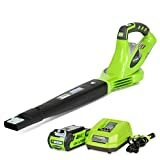 Since it’s corded, it is a bit more powerful than the cordless electric from Greenworks, running at 160mph and 150CMF. The cord lock means you’re not going to accidentally pull the cord out while you’re working, and it’s as quiet as the cordless Greenworks model. It’s also just as light. At around $30, the price is a fantastic deal. The only major issue is that this is a single-speed model, and the extension cord must be purchased separately. This means you lose out on versatility. This is important when you consider that even at the high speed of 160MPH, it’s still not the best option for anything wet, might make you consider another model. 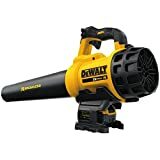 But for an electric leaf blower at this size and price, it’s plenty powerful enough. 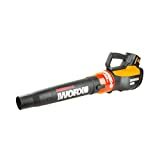 Buy now from Amazon → Another great blower from Black and Decker. This is even lighter than the LW36, at less than 4 lbs. This makes it perfect for working all day. 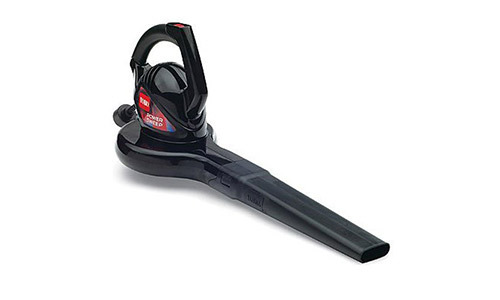 It’s great for light yard work, with a built in scraper to loosen wet leaves and grass. This still is not the best option for surfaces that are not flat, but it does have a locking switch, which helps cut down on strain to the hand and wrist. 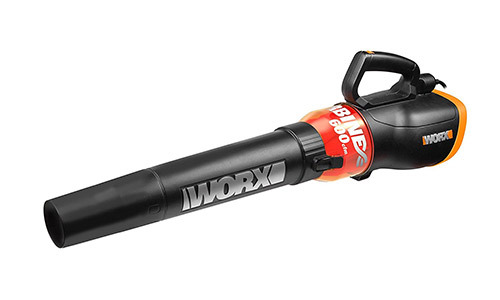 Buy now from Amazon → The Worx Turbine WG591 is a seriously powerful machine. Running at 125 MPH with a rate of 465CMF and a brushless motor, the WORX TURBINE has a variable speed and a wide nozzle for extra tough jobs. It is a lot heavier than others on this list, about 8 lbs, but it runs as smoothly on flat surfaces like driveways as it does on your lawn. 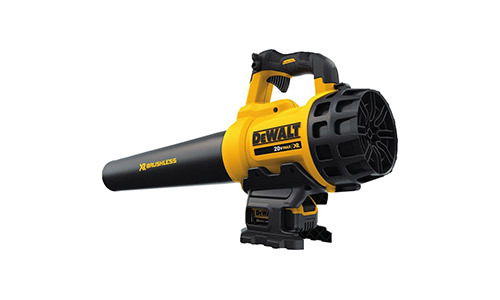 It’s a great workshop blower too, as it can handle small piles of debris with ease. It runs almost as high powered as the best gas machines. Another Black and Decker option. This blower, like others in the Black + Decker family runs at 20V, while still giving you 130MPH of air speed. The extended nozzle helps you to get into tight spaces, but may compromise on CFM. Like others in the Black and Decker line, you may find it is difficult to use on your lawn. However, the powerboost option makes it easier to remove wet grass or leaves from your deck, driveway or sidewalk. 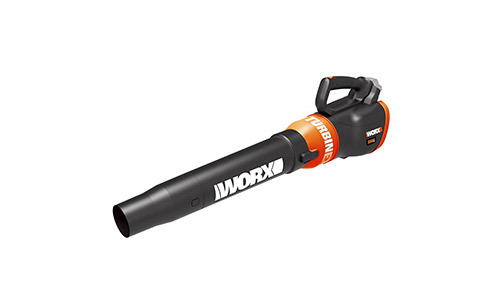 Buy now from Amazon → This is a lighter version of the WORX TURBINE. The 20V battery takes a lot less power, and is a lot lighter at 6 lbs. The lower speed setting is great for light work, and the higher speeds a great for working on your lawn and blowing wet grass or leaves. Be aware, a lot of reviews warn against long charge times (manufacturer says 90 minutes, but users report longer waits) and will only run 15-20 minutes at high speed. You may want to buy an extra battery for this one. 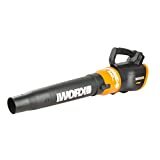 Buy now from Amazon → As a corded leaf blower, the WG520 is significantly more affordable an option than the cordless electric models. Like the other WORX TURBINE models reviewed here, it is one of the most powerful options you can get, comparable to gas powered blowers. With the variable speed options, you can change your speed preference depending on the job you’re tackling. Air flow runs at 110 MPH. With a maximum CFM rate of 600, you can switch from light workshop cleaning to heavy-duty yard work with ease. Because it’s a corded model, you never have to stop to recharge! 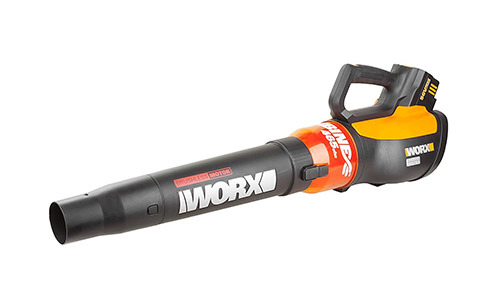 It’s about the size of the WORX WG546, at 6.4lbs, with a significant increase in power. PowerIt can be tempting to aim for a high MPH rate in your leaf blower, but the most important number is the CMF. This measures the cubic feet of air blowing out of the machine per minute. The higher the CMF rating, the more power in your blower. The truth is, no electric leaf blower can blow like a gas-powered machine can. However, there are things you can do to make sure you’re getting the most power out of your machine. First, you should know that corded electric blowers tend to be more powerful, and more consistent with their airflow. The drawback with a cordless model is they are noisier, and less suitable for larger yards, where your only option is extra-long extension cords. These cords can be dangerous, and easily damaged if they aren’t given enough slack. Think about the size and shape of your yard, and what you need the blower for before making the decision between a cordless or corded electric. You should also be aware that a brushless motor tends to be more powerful than a brushed motor, on average. Gas powered leaf blowers are so notoriously loud that many neighborhoods have banned their use. Electric leaf blowers tend to run quieter, but even so, check with neighborhood guidelines to know the decibels you are required to stay in. Ideally, you won’t want a leaf blower louder than 70 dB. Gas or electric, corded or uncorded, always protect your ears from the sound, and your hands from the vibration of the leaf blower. Nowadays, most battery-operated tools use rechargeable lithium-ion batteries. Some corded leaf blowers have the option to unplug and use a battery, either nickel cadmium, or lithium-ion. Nickel cadmium batteries tend to be more inconsistent in their power usage as they drain, where lithium-ion batteries are more consistent throughout. Generally, the higher the CMF rating, the faster your battery will die. Compare the battery usage with the size of your yard, the type of work you need to do, and how ergonomic the machine is. How long will you use it in a day to get the job done? You may consider buying an extra battery, to save yourself the charging time. Corded electric leaf blowers obviously don’t have these issues, but be aware of the voltage you’re using. 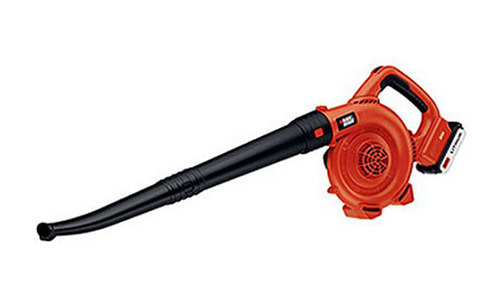 Some leaf blowers allow for a change in voltage, either up or down, at the expense of power. For others, it’s dangerous. Size is an important consideration. Electric blowers tend to be smaller than gas powered blowers. They also have smaller motors. 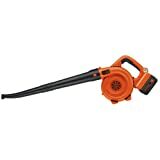 Corded leaf blowers tend to be more powerful, larger and heavier. 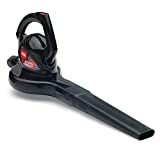 If you choose to use an electric leaf blower for light duty cleaning on hard surfaces, you’ll likely only need a light leaf blower, which may be 4 lbs or less. For more heavy-duty jobs, you’ll need something heavier. The size of your nozzle is also important. Bigger nozzles mean more air flow, and are more suitable for large yards and uneven surfaces, like your lawn. Smaller nozzles concentrate airflow, and are perfect for removing wet grass and leaves from pavements and decks. When you are choosing an electric leaf blower, you have many options. 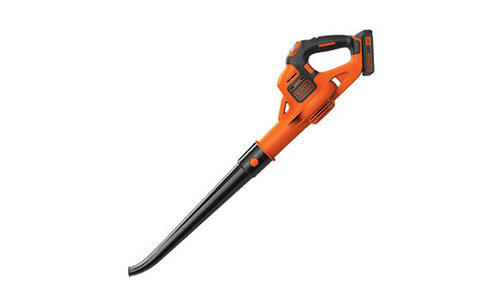 Choosing a corded leaf blower can get you a lot of power, sometimes even comparable to a gas powered leaf blower. But if your yard is big, or there are smaller jobs in particular areas, you may not be able to get the air flow you want where you want it. The more powerful machines also tend to be heavier, so always choose something that you can use comfortably. Finally, battery power can change depending on the type of battery you use, how often you plan to use the blower, and how much power the blower takes. With all of this to consider, it is important to fully examine your options while searching for the right leaf blower. We are confident that with this guide, you will have a better understanding what to look for in your leaf blower.